To get around you will require snowshoes for your winter camping or hiking. Snowshoes are suitable for hiking in the wilderness letting you float above the snow and tackle those ascents and descents along the trails. When picking your snow shoes be sure to check out the weight restrictions as for some models you may also require tails. Your snowshoe frame should be made of aluminum, very hollow and light. For the decking coated nylon is lighter and will last longer than plastic. Essential on mixed terrain, a crampon is a sharp piece of metal that pivots and digs into the snow for easy climbing. Your binding could be a simple strap which is easy to replace or the snowboard ratchet system. If you like exploring winter trails the Redfeather Hike Snowshoes will have you almost floating over that fluffy white stuff in comfort. Rugged Binding – features Z-pattern nylon straps with side buckles for easy and quick adjustments to any size boots. I hike with a club and others take can sometimes take a while to adjust their snowshoes in the freezing temperatures so you can really appreciate this feature. 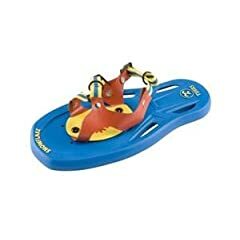 The heel strap is molded from tough, flexible polymer and fitted with a special toggle-activated buckle. A flat, textured foot bed provides a solid foundation for traversing and climbing. 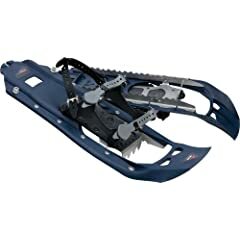 Live Action Hinge – this is designed to lift the tail of the snowshoe from so that it does not drag in the snow with every step which adds mobility and speed. Frame – extruded 6000 series aircraft aluminum tube frame with rounded Western tail design for maximum flotation. Decking – TX35 rip stop vinyl decking with a puncture and abrasion resistant material that keeps you aloft even in sub zero temperatures. Crampon – powder coated to shed ice and snow as there is nothing worse than having to stop and clear out frozen ice balls from your snow shoes. The crampon is constructed of high quality stainless steel for superior strength and features an aggressive toe and heel design which insures maximum purchase with each step on all terrains. 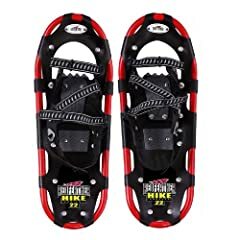 There were plenty of positive reviews for these snow shoes. 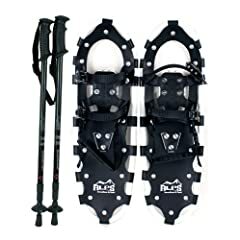 Numerous reviewers commented that they provide good traction, are lightweight, and that the bindings stay tight during the hike with virtually no shifting. A number of reviewers remarked that they appreciated these snowshoes are made in the USA and of top quality construction. One reviewer did report an issue with the live action hinge as it was throwing up snow when he was walking at a slow speed, however he did make some alternations and reports they are now working fine. 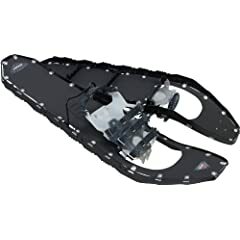 Click here to check out all our snowshoes. Based on their excellent performance record I would definitely recommend Redfeather Hike Snowshoes to anyone who does a lot of winter hiking.